The name Geysir actually means to gush in Icelandic and this is the geyser that all the others geysers are named after! Geysir is one of Iceland’s most renowned characteristics. It is located in a geothermal area in Haukadalur and is surrounded by other smaller, but more active geysers like Strokkur, which erupts approximately every 15 min sending boiling water 10-40 meters up in the air. Geysers are rare and very fragile natural phenomenons. Water seeps down through the ground and gets in contact with hot rocks. This geothermally heated water now rises towards the surface. Usually the water enters the surface calmly, resulting in a geothermal, hot spring area. With geysers, the water only has narrow "plumming systems“ to enter the surface. The geyser cavity fills up with hot water and builds up pressure which is finally released in an eruption to the surface. 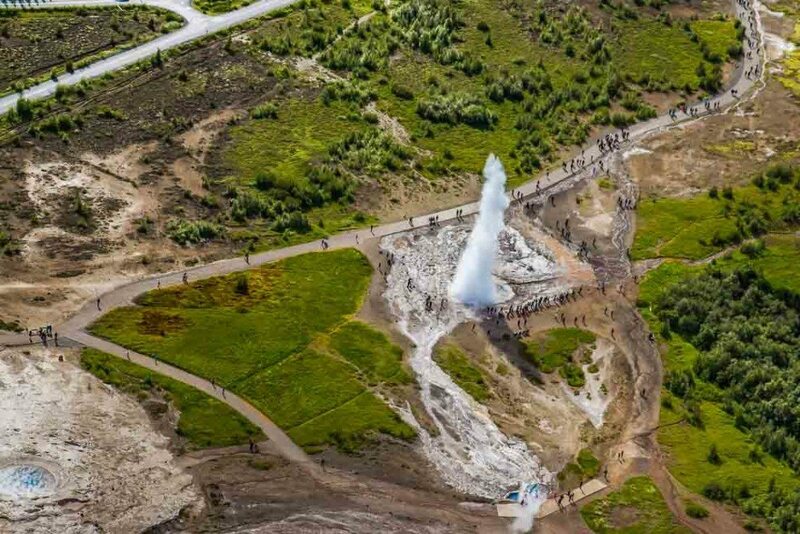 While the best way to experience a majestic geyser eruption is from the ground, we also cover the Geysir geothermal area on our Essential Iceland tour.